This entry was posted in Event on July 4, 2018 by Janet Markman. At the Grover Cleveland Birthplace 4th of July Ice Cream Social this year (2018), the educator “Traveling Trunks” will be spotlighting “Baseball” and the connection to Grover Cleveland and other Presidents. Young (and older) attendees at the “Social” will be encouraged to see our display and take “first pitches” with red, white, and blue wiffle balls. Attendees will also be treated to our previous displays, “The Origins of Basketball” and “The History of the Frisbee”. You might also see a few people recite “Casey At the Bat” and sing “Take Me Out to the Ballgame” at our annual event. In the recent book, The Presidents and the Pastime: The History of Baseball and the White House by Curt Smith, Smith discusses a 1885 meeting with the championship Chicago White Stockings and President Grover Cleveland at the White House. Cleveland was a long time baseball fan. When meeting “Cap” Anson, Captain of the White Stockings, Cleveland asked how his old friend, Jimmy “Pud” Galvin was. When Cleveland was sheriff and mayor of Buffalo, he and Galvin were good friends. Cleveland was a fan but certainly not in playing shape when President. In the book Baseball, The Presidents’ Game by William B. Mead and Paul Dickson, the authors also write of this White House meeting. When greeting the rest of the team, Cleveland had difficulty shaking the hands of the physically fit White Stockings players. Player Mike “King” Kelly wrote, “There wasn’t a man in the crowd that wasn’t six feet in height and were all in lovely condition. Their hands were as hard as iron. The president’s hand was fat and soft”. When Kelly shook Cleveland’s hand, he “….squeezed so hard that he winced”. As a result, Kelly reported that Cleveland’s hand was in pain and very swollen. Kelly added, “…he would rather shake hands with 1,000 people than a bad nine after that day” and did not shake hands with the team when they left. Cleveland’s hand nearly “doubled in size”. (Mead and Dickson point out that Cleveland was our second heaviest President and weighed 250 pounds. Cleveland once said, “bodily movement is among the dreary and unsatisfactory things of life”.) Although Cleveland had challenges with the handshaking, Kelly concluded, “He impressed me as being a charming, courteous gentleman who had considerable backbone, and democratic enough to be a Democratic president of our glorious country”. Cleveland’s Victorian work ethic is spotlighted in this meeting with the White Stockings. When leaving, Anson asked Cleveland if he would come to a White Stockings game but the President turned him down. Cleveland stated, “What do you imagine the American people would think of me if I wasted my time going to the ball game?”. Smith writes how Cleveland understood how Victorian America would “applaud” him for his work ethic..
Presidents attending baseball games didn’t end with Cleveland’s decision not to go to a game. In between Cleveland’s two terms, Benjamin Harrison became the first president to attend a major league game (June 6, 1892) when he saw the Cincinnati Reds beat the Washington Senators, 7-4 at the Swampoodle Grounds, which was located on the grounds of the present Union Station. By Cleveland’s second term, he had John Geydler, a government clerk recite the poem Casey at the Bat: A Ballad of the Republic Sung in the Year 1888, by Ernest Lawrence Thayer when delivering a document to the White House. In later years, Geydler became President of the National Baseball League. A copy of Casey at the Bat was recently donated to the Grover Cleveland Birthplace Memorial Association 1880’s/1890’s “traveling trunk” for educators. The website of the National Baseball League mentions the following “tidbits” about Presidents and their connections to baseball. — George Washington: At Valley Forge, an unidentified soldier mentioned in his diary the game of “base”. He writes, “He [Washington] sometimes throws and catches a ball for hours with his aide-de-camp.”. — Andrew Johnson: A big baseball fan, Johnson also watched baseball being played on the “White Lot”. (Mead and Dickson report that when there was a Washington city match between the Washington Nationals, Philadelphia Athletics, and Brooklyn Atlantics, Johnson have government employees time off to watch). — Ulysses Grant: Grant was the first to have a professional team (the Cincinnati Red Stockings) to visit the White House. — Chester A. Arthur: Arthur brought the Cleveland Forest Citys of the National League to the White House. — William F. McKinley: McKinley brought the Washington Senators to the White House. — William H. Taft: In 1910, Taft started the traditional “first pitches” of the season by throwing to Washington Senators pitcher Walter Johnson. — Franklin D. Roosevelt: FDR choose not to “suspend” playing during World War II. — John F. Kennedy: JFK threw three “ceremonial” first pitches for the Washington Senators and at the 1962 All Star Game, Although he was a Red Sox fan, he never attended a game at Fenway Park in his years as President. — Richard Nixon: Even when living and working in Washington, D.C., President Nixon always called the California Angels his “hometown” team. In 1972 (as President) and 1992 (post Presidency), Nixon published his “pick” for historical dream teams from 1925-1992, (Smith). — George H.W. Bush: A former Yale first baseman, Bush gave the “first pitch” at the first “new old park”, Oriole Park at Camden Yards, (Smith). — George W. Bush: On October 11, 2001, Bush gave the “first pitch” at the World Series following the attacks on 9/11. In front of a crowd at Yankee Stadium, the President threw a perfect strike. Bush was also a managing partner of the Texas Rangers before becoming Governor of Texas and President. — Barack Obama: In addition to the MLB website, Smith reports that in 2011, Obama was set to throw out the first ball for the Washington Nationals’ season. He hid his “hometown” White Sox cap when going to the mound, put it on, and pitched. Mead, William B. and Paul Dickson, Baseball, The President’s Game. Farragut Publishing Company, Washington, D.C. 1993. Smith, Curt, The Presidents and the Pastime: The History of Baseball and the White House. Lincoln: University of Nebraska Press. 2018. Spencer, Lyle, “Baseball, Presidents Go Back A Long Way”, Major League Baseball website, accessed June 25, 2018. This entry was posted in News on June 25, 2018 by Janet Markman. Come One, come All to the Ice Cream Social at the Grover Cleveland Birthplace in historic Caldwell, N.J. for a fun filled celebration with free Ice Cream, good food, a street magician, Fideaux Flea Circus, free lemonade, popcorn, a DJ, house tours, and the traveling trunks displays. Even free balloons and a balloon lady to make animals for the kids. The opening ceremony and the reading of the Declaration of Independence begins at 1 pm. Bring chairs and blankets and enjoy being outdoors from 1-4pm. 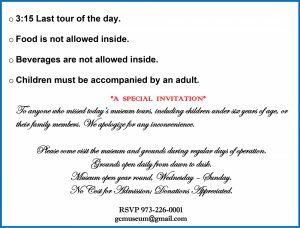 Sponsored by the Grover Cleveland Birthplace Memorial Association, the Social is at the Grover Cleveland Birthplace, a New Jersey historic site at 207 Bloomfield Avenue, Caldwell, N.J. 07006. Free parking is in the adjoining Saint Aloysius Church lot. Ice Cream is provided by Gelotti’s Ice Cream; food is available from the Cloverleaf Tavern. Rain site, Saint Aloysius gym next door. For bakers, there is a cookie bakeoff with prizes. This year’s cookie is the chocolate cookie–soft, hard or dropped but not brownies. The rules are simple, each entry must be made using a recipe from the 19th century using ingredients available in that period and must be accompanied by two copies of the recipe. The recipes are being gathered and will be published with the past winners recipes in a special Grover Cleveland Cookie Book. 2 dozen cookies are necessary for the judges to sample and cookies and entry forms must be presented before 1:30 on July 4th at the Birthplace. Forms can be found at the Grover Cleveland Birthplace website or at the Birthplace during open hours. This entry was posted in Event on June 22, 2018 by Janet Markman. Caldwell Councilman Jonathan Lace presents a proclamation and speaks at Grover Cleveland’s birthday celebration on March 18, 2018, which was Grover Cleveland’s 181 birthday. To see the proclamation click here. For those who could not attend below is the transcript of Jonathan Lace’s speech. Thank you to the Board of the Grover Cleveland Birthplace Memorial Association for inviting me to say a few words today about the significance of President Cleveland for Caldwell. Today, at the beginning of Grover Cleveland Week as we celebrate his 181st birthday, I want to briefly mention two aspects of his legacy that I believe can serve as an example for us: his belief in political responsibility and his commitment to people before party. This quote grabbed my attention that day and has made quite an impact on me. It is an attempt to redeem a term that has become synonymous with corruption and to reclaim its actual meaning. It is a reminder to all of us that we should all be “politician enough” to get involved in issues of government at every level: local, county, state, and federal. We may not all decide to run for office, but we all can educate ourselves about public policy; we can all talk to a neighbor, we can all write a letter to the editor, we can all volunteer to serve on a municipal committee or at the food bank. We can all serve the public in some capacity. We can share our talents, our time, and our creativity with the world around us, starting right here in the Caldwells. And all of us need the benefit of each other’s ideas. There are significant policy questions facing our local communities that urgently need all of our input. For example, should Caldwell merge its police department with West Caldwell? Should Caldwell sell its public water utility to a private company or bond the roughly 4.5 million dollars necessary to repair its hydraulic infrastructure? Should Caldwell repair the parking deck of the Community Center piecemeal or begin from scratch? These questions, that have already been touched on in Council meetings this year, need public input so that local officials can be held accountable to the people. In his first Inaugural Address, President Cleveland said that every American owed to the country a “close scrutiny” of public officials with a “fair and reasonable estimate” of their performance and that this was the “price of our liberty.” To continue the analogy, if we do not become aware of what is happening in government, we become guilty of stealing our liberty by not paying our fair share of attention to it. Given the availability of meeting records and the ability to watch meetings from the comfort of our homes, it is a relatively small price to pay. If you’ve never attended or watched a Council or other public meeting, this week would be a great time to begin. Given the current political climate as reflected in national trends and social media, I believe that we can all agree that we live in such a time. Perhaps we should make a specific effort this week to remember that we are all Americans first and that parties are merely a means to a more perfect Union, knowing that we all want what’s best for our community, even if we may disagree on how to achieve it. Let the days be forever gone when we are criticized for extending (or even shaking) the hand across the aisle or acknowledging good ideas, regardless of which side or school of thought offers them. Let us emulate Grover’s commitment to people before party. During this Grover Cleveland Week in Caldwell, the Borough encourages all residents who are able, to visit this birth house and learn more about his legacy. I hope you find his call to political responsibility and his commitment to people before party both motivational and inspiring. 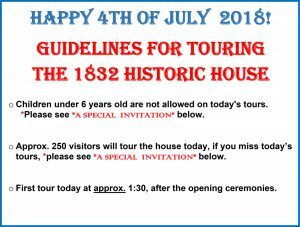 Perhaps President Grover Cleveland Week can become something more than encouraging residents to visit this birth house, as worthwhile as that always is. Perhaps it can become a week of celebration, education, and service for which Caldwell will also be known, enriching both our Borough and visitors from across the country. This entry was posted in News on March 21, 2018 by Janet Markman. 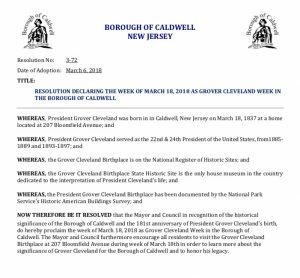 Councilman Jonathan Lace submitted Resolution 3-72 declaring the week of March 18th, 2018 as Grover Cleveland Week in the borough of Caldwell to the Council for consideration at the 3/6/2018 meeting. The resolution passed! 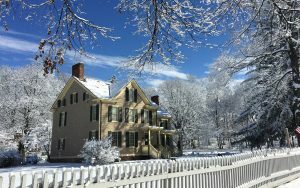 Please make sure to visit the Grover Cleveland Birthplace House during the week of March 18th. This entry was posted in News on March 15, 2018 by Janet Markman. GCBMA welcomes three new trustees to it’s board. October 31, 2013. Chatham, NJ Marta McDowell at home. Marta McDowell teaches landscape history and horticulture at the New York Botanic Garden. 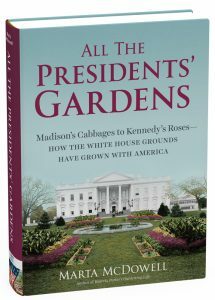 She was awarded the American Horticultural Society book award for her book All the Presidents’ Gardens. That book also made The New York Times best seller list. Ms. McDowell won a 2014 Gold Award from the Garden Writers Association for her book, Beatrix Potter’s Gardening Life. 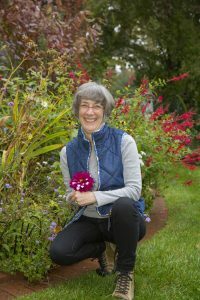 She is now working on a revision of her first book, Emily Dickinson’s Gardens due out in a full color edition by Timber Press in 2019. A popular lecturer, she has been a featured speaker in locations ranging from the Chicago Botanic Gardens to the Smithsonian Institution. Registration is at 9:30am followed by coffee, tea, and other refreshments. The meeting begins at 10:00am. Following her lecture, Ms. McDowell will be available to sign her book and there will be a box lunch served. The cost per person is $35 for the lecture and lunch. Make reservations via e-mail or phone. After lunch, there will be a teacher’s workshop from Grades 3-12 to introduce materials from the “Traveling Trunks” program available from the Grover Cleveland Website, opportunities for school trips, and to introduce educational outreach plans and possibilities with the upcoming building of the Grover Cleveland Birthplace Visitor’s Center. 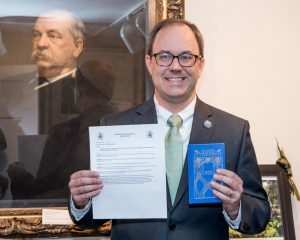 The GCBMA offers a Traveling Trunks Program for educational institutions,service organizations, and other groups interested in keeping the legacy of Grover Cleveland alive, as well as getting to feel the historical past of how people of three different periods lived and were influenced by the historical events of their day. There are three Traveling Trunks, representing the 1830’s, 1860’s (Civil War) and1880-90’s. The Trunks are portable history lessons that can travel to schools, scouts,home schooling parents, nursing homes, and other organizations. Participants at the workshop will examine the contents of the trunks and be introduced to ways the artifacts can be used in the classroom. Professional Development certificates will be offered for the entire day. This part of the workshop will last approximately one hour. This entry was posted in Event on February 12, 2018 by Janet Markman. (a) December 29th-31st. “Homecoming Open House” Extended hours allow residents and their out-of-town house guests to visit the museum and gift shop: All out of town guests will receive a treat or souvenir to take home. Friday, Saturday and Sunday prior to New Year’s Day. Visit the museum and gift shop 10-4 Friday, 10-4 Saturday and 1-4 on Sunday. (b) Monday, January 1st: “First Day Hike.” Begin 2018 by taking a short guided group hike throughout Caldwell. Gathering and open house at the Birthplace 11am-12noon. Hike commences at noon. Call 973-226-0001 to register. (c) Sunday, January 7th. Last day to view holiday decorations. Open 1-4pm. Mon 1/1 “First Day Hike” 11am Open House, 12 noon hike – CANCELLED – due to extreme cold weather! This entry was posted in Event on December 16, 2017 by Janet Markman. This entry was posted in Event on November 15, 2017 by Janet Markman. 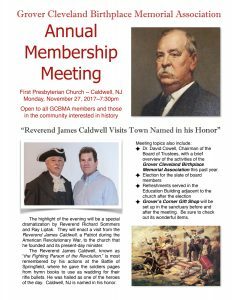 The Grover Cleveland Birthplace Memorial Association will hold its Annual Membership Meeting on November 27 at the First Presbyterian Church at 7:30. The meeting is open to all members and other members of the community interested in history. The highlight of the evening will be a presentation by Reverend Richard Sommers and Ray Lipak. They will re-enact a visit from Reverend James Caldwell to the church he founded and its minister of today. Dr David Cowell, Chairman of the Board of Trustees will give a brief overview of the activities of the Grover Cleveland Birthplace Memorial Association this past year. There will be an election of the slate of board members. There is one vacancy on this panel. Nominations from the floor will be accepted. Personal information should be available about any nominees from the floor. Following the election refreshments will be served in the Education building adjacent to the church. Grover’s Corner gift shop will be set up in the sanctuary before and after the meeting. Be sure to check out the wonderful items. This entry was posted in Event on October 26, 2017 by Janet Markman.